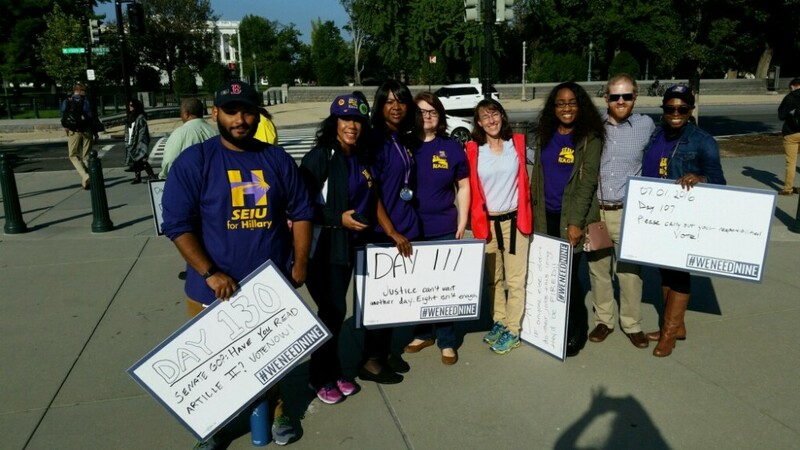 On October 4, 2016 NAGE Federal Staff joined the #WeNeedNine Protesters in front of the United States Supreme Court in Washington, DC. The protesters are fed up with Senate Republicans who are refusing to do their jobs and allow for a hearing to confirm or not confirm President Obama’s Supreme Court nominee. Justice Antonin Scalia passed away several months ago and the Supreme Court has been 1 Justice short with only 8 sitting members instead of the normal 9. The even number of Supreme Court Justices causes a problem because if the vote is split 4-4 a decision is not reached and the case is referred back to the lower court.